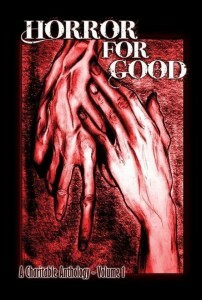 Horror For Good is a charity anthology benefiting the AIDS charity amfAR and published by Cutting Block Press. Edited by Robert Shane Wilson, Mark Scioneaux and RJ Cavender, the collection features some of the biggest names in horror, and I’m absolutely thrilled to be part of this killer line up. My story, To and Fro, is a twisty dark SF tale with a sting in the tail. I can’t say much more than that, but I hope you’ll enjoy it. If you don’t it’s no biggie, as there are a ton of quality stories in here, plenty to be sure to cater to all horror tastes. Here’s the full (eye-popping) table of contents. Every penny of profit on each sale goes directly to an excellent cause. If you’re interested in getting into horror fiction, it’s an excellent way to sample writers you might find become firm favourites. Get it now from Amazon US or Amazon UK! …regardless of whether the author is a big-gun or a novice (one of the stories is the author’s first published sale), all of the stories are well worth reading. For the truly selfish ones out there, screw the publisher, screw the charity, get this for yourself, it’s one of the best collections of stories I have seen … and I’m probably older than you. And the second review is by S.C.Hayden and is short enough to quote in full. Not this one though. Every tale in this collection is good, some are very good and a few are great. Lastly for Goodreads, Sheri White posted this model of brevity. Most of the stories were great, but a few just didn’t do it for me. I’m going to go out on a limb here and state that I have absolutely no doubt that the book itself is going to win awards. It’s simply that good! So, from the viewpoint of quality alone, if you only buy one horror anthology this year, you should seriously consider grabbing this one. When you add to that the fact that it’s for such a worthy cause, then how can you not buy it? Meanwhile, Dave at Hellnotes provides a very detailed and very positive review. He “singles” out nearly every story in the collection for praise, except a handful (including mine). I’ll try not to take it personally! The review is great though. Although many stories will strike a painful note for readers, the best stories of this bunch share the ability to dig their claws into the hearts of every reader who decides to pick up this compilation of truly good horror fiction and not to let go. At last, my story gets a little love courtesy of the Horror Fiction Review. In this writeup, To and Fro is picked out for special mention as one of the twelve best stories in the anthology. About bloody time! :) Scroll down over halfway down the page for the review. I went through the book meaning to mark down the ones that really struck me as being among the best of the best, and before you know it I had marked more than a third of them!